If you’re considering purchasing the Market Samurai keyword research software, then hopefully my Market Samurai review will help you decide whether you need this tool or not. Read on and find out how it can help you become a marketing samurai! Before you read the rest of my Market Samurai review, check out the video I’ve created below. It shows you some of the features of the software, how to navigate it and exactly what data it provides you with. This is, along with the ‘SEO Comeptition’ feature, are the only two modules in Market Samurai that I really use. To be honest, my decision to buy Market Samurai was based solely on these two modules. I would say that the Market Samurai price of $149 (or only $97 if you follow my instructions at the end of this review) is well worth it just for these two modules alone, the other modules are just a bonus really. The Market Samurai keyword research feature lets you either manually input keyword ideas, or if you already have a list, you can import them directly in to it. If you have neither, then this is where this module is really useful. You can simply click the ‘Generate Keywords’ button and the Market Samurai software will then generate a list of related keywords for you. Once you click on the ‘Keyword Analysis’ button, you will be taken to a new screen and all your keywords will be ready to be analysed. This is where the software really comes in to its own and pays for itself many times over in my opinion. The screenshot below will show you just some of the data that Market Samurai gathers for each keyword. Searches: Average number of people who search for this keyword (You can set the results to display daily, weekly or monthly searches). SEOT: An estimate of how many clicks you could receive if your site was number 1 in the search engines for that keyword. This is really just an estimate, as obviously your title, alt text and other factors will also play a role in your search engine click through rates. PBR: The percentage of phrase match searches out of broad match searches for this keyword. SEOC: The total amount of web pages globally that mention the specific keyword term, in the same (phrase) word order. SEOTC: The total amount of web pages globally that mention all of the words in the keyword term in the title of the page. SEOUC: The total amount of web pages globally that mention a specific keyword term, in the same (phrase) word order in their URL. SEOTCR: This is the ratio of SEOTC to SEOC. A low score here can indicate weak competition. MSEOTC: The number of pages in Majestic’s index that mention all of the words in a keyword term in the title of the page. MSEOUC: The number of pages in Majestic’s index which mention all of the words in a keyword term in the URL of the page. MSEOAC: The number of pages in Majestic’s index that contain the keyword term in the anchor text of an external, inbound link. MSEODC: The number of pages in Majestic’s index which mention all of the words in a keyword term in the domain name of the page. MSEOTAC: The number of pages in Majestic’s index that contain the keyword term in both the page title and in the anchor text of an external, inbound link. Trends: Indicates monthly traffic trends for a particular keyword. AWT: The total traffic (clicks) that a number 1 ranked Google advertiser might expect to receive from their ads for that specific keyword (Again, you can set the traffic to display daily, weekly or monthly). AWC: Represents the number of advertisers bidding on a keyword, and how this compares to other keywords. AWCPC: An indication of what you might expect to pay to be the number 1 ranked advertiser for a particular keyword in Google. AWCTR: The percentage of people who click on the number 1 ranked advertiser in Google (AWT) as a percentage of total traffic for a keyword. AWV: The total value of traffic (and also the cost) a number 1 ranked Google advertiser might expect to receive if advertising for a keyword (Again, you can set the traffic to display daily, weekly or monthly). SEOV: The total value of traffic that a website ranked number 1 in Google for a keyword could potentially achieve. (Again, you can set the traffic to display daily, weekly or monthly). So basically, at the click of a button you get all the competition data for each keyword you could ever possibly want. 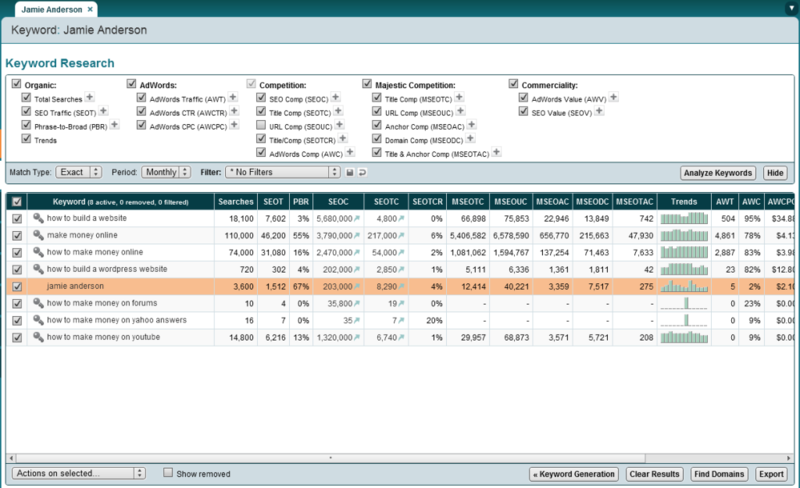 You can then use this data to find keywords to target that don’t have a lot of competition and decent search volume. Trying to gather just some of the competition information that Market Samurai gathers for only one keyword MANUALLY would take at least 20 minutes. This software does it for you on scores of keywords at the click of a button! I really don’t need to tell you how powerful and how much of a time saver this one module is alone, I’m sure you can see the benefits. My second favourite thing in Market Samurai is the ‘SEO Competition’ feature. What this does is takes the keyword you want to target and displays the top 10 results of that keyword on Google’s front page. It then provides you with another graph of metrics to help you establish how tough the competitor sites are fro that keyword. Check out the screen shot below to see an example. DA: The age of the domain. PR: The Google Page Rank of the domain. CF: Majestic’s ‘Citation Flow’ – similar to Google’s Page Rank. TF: Majesti’s ‘Trust Flow’ – measure of a web page’s author/trustworthiness. IC: Index Count – the number of pages on this domain that are indexed. RDD: The total number of unique with backlinks pointing to a specific domain. RDP: The total number of unique domains with backlinks pointing to a specific page. BLP: The total number of links pointing to a specific URL. BLD: The total number of external links pointing to any page on that domain. BLEG: The total number of .edu and .gov backlinks pointing to a webpage on the site. DMZ: Whether or not the site is listed on DMOZ. YAH: Whether or not the site is listed in the Yahoo Directory. Title: Whether or not the webpage title tag contains the keyword. URL: Whether or not the website URL contains the keyword. Desc: Whether or not the word appears in the meta description tag. Head: Whether or not the keyword appears in the header tags within the page’s content. Once again, this feature of the Market Samurai software is a massive time saver! It generates all this info for the top 10 sites on Google’s first page for your targeted keyword at the click of a button, and it takes around 30 seconds! To get all this important data manually for even one website would take at least half an hour! Domains: I have actually got some use from this feature in the past and if you are someone who is looking to regularly purchase domains to resell, then this is a great feature. It’s also good for finding exact match domains. 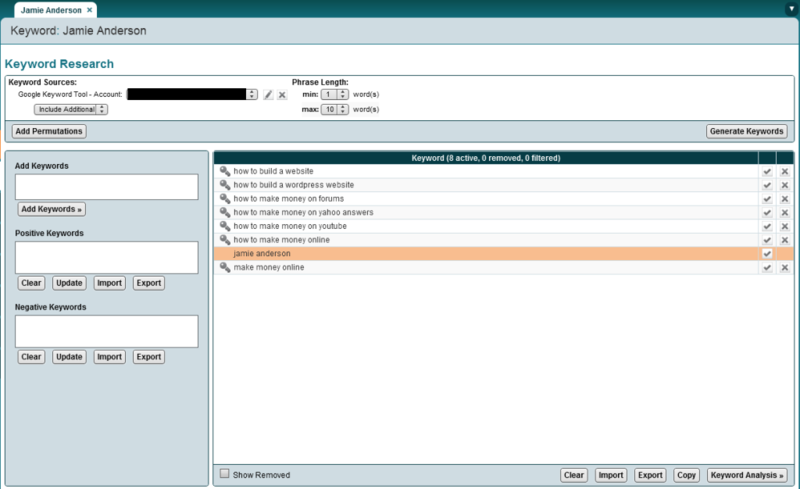 You simply type your desired keyword(s) in to the ‘Seed Keywords’ field and press the ‘Find Domains’ button. 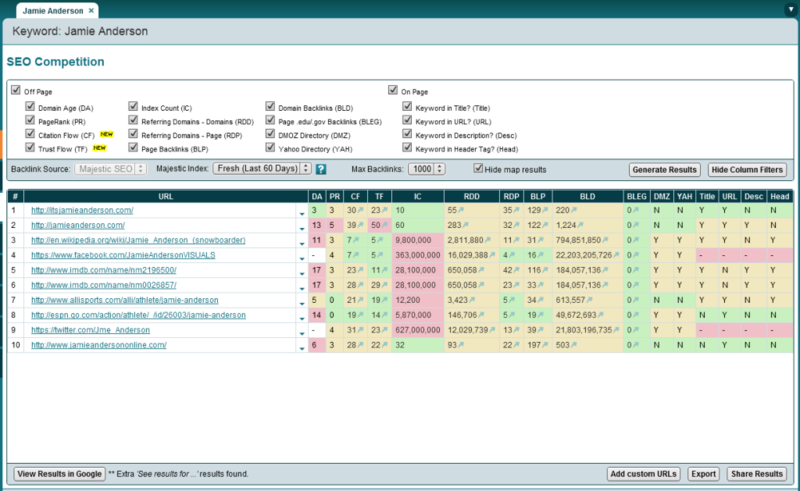 Market Samurai then gathers a list of available domains that are relevant to your selected keyword(s). Monetization: This module is helpful if you are entering a new market. Let’s say that you have done some keyword research using Market Samurai and have found some low competition, high traffic keywords you’d like to build a site or publish an article to target. Using the ‘Monetization’ module let’s you search Amazon, ClickBank, CJ and PayDotCom using your keyword to unearth possible products that you can promote as an affiliate. Find Content: Again, this part of the software wasn’t behind my reason to buy Market Samurai. However, it may be useful to you. All you do here is select which sites you want Market Samurai to search (article directories, blogs, picture/video sites, news sites and answers sites etc) then click ‘Find Content’. You will then be presented with a list of content that contains your keyword that is found on the sites you have selected. What you do with this content is up to you. One way you could use it is to get articles that you can reference or rewrite in your own words to produce your own unique content. Publish Content: I have to be honest here and admit I’ve never once used the ‘Publish Content’ section in the software. It is an area where you can publish content to numerous sites and blogs that you own, so it kind of acts as a universal dashboard to publish to all your blogs in one place. I myself don’t need this feature as I only publish content regularly to a few sites which I prefer doing from within WordPress anyway. However, if you have a lot of blogs to manage then this could be just what you need. Promotion: The promotion part of the software is a part that I have neglected somewhat over the years and have only started using more often recently. It gives you a list of Web 2.0 sites, answers sites, blogs and forums. You select which ones you want Market Samurai to search through and you then get a long list of sites and pages that contain your keyword and are relevant link building opportunities. You can use these sites to get a blog comment on, reach out to request a link or a guest post or any other number of ways you can think of to use these sites and pages to promote your own content. That’s pretty much all of the different features in Market Samurai covered apart from the rank tracking feature, which I’ll cover later in this Market Samurai review. Let’s have a look at some of the other concerns you may have and some of the Market Samurai frequently asked questions I see online. If you’re an experienced internet marketer and have your fair share of tools, you will know that some can take a lot of hours before you can really get to grips with them. One thing that’s great about this software is it is very simple to use. The Market Samurai Dojo is an area on their website that has lots of training videos which guide you through each module and show you exactly how to use it. They also have a large knowledge base section there and a support forum. I have had this software for a good few years now and have only had one problem with it in all that time, and it was sorted out via email within a couple of hours. So I can’t fault the support at all. The software is updated very regularly. I use the software at least every two or three days and I would say that the software usually has an update on average once a week. There’s nothing worse than buying software that the developers turn their back on and are slow to fix when problems occur, the guys at the Market Samurai Dojo certainly can’t be accused of that! Don’t get me wrong, the Market Samurai tool delivers great value in my opinion. I’ve been using it for many years now and I would honestly be lost without it. However, it is not perfect. My only problem with the Market Samurai software is the rank tracking section. Up until around 18 months ago, you could also use Market Samurai to track the rankings of your targeted keywords in the search engines for an unlimited amount of websites. This made Market Samurai, along with its other features, probably the best value SEO tool available anywhere. Unfortunately, due to some reported changes in Google’s algorithm, or API, or something along those lines (can you tell I’m not exactly technically gifted!? ), this got changed in to a standalone pay monthly service. Now I’m personally not complaining too much, as I got 50 keywords a month for free anyway as I had been a long term customer, but it’s just a shame because I used to track hundreds of keywords using the software for all my sites. Regarding the ranking tracker, what I don’t understand is how there are other pieces of software on the market now that can do exactly what the Market Samurai version did which are sold for one time fees. It’s just a shame Market Samurai couldn’t have worked it out but that’s in the past now and in all honesty, the software still provides massive value and what it used to be shouldn’t put you off what it is today. Market Samurai costs $149 to buy the full version. HOWEVER… If you download the Market Samurai trial version first (click here to download Market Samurai free trial), what happens is that you are offered a discount from the guys at the ‘Market Samurai Dojo’. This discount means you can get the full version of the Market Samurai software for only $97! So you get the best of both worlds really, if you download Market Samurai free version you will get to play around with it for a bit to get used to the interface, then you can get it for the discounted price of $97 too, it’s a win-win! If you’ve got to the end of this Market Samurai review (I know it’s been a long one, but I wanted to try and cover as much as possible for you guys) and have any questions about the software, then please feel free to ask away in the comments section below. I think the competition information would be worth the cost. Especially being able to see if they have optimized for keywords. I agree Stephen, this is what I mainly use the software for on a daily basis too. Thanks for the kind words Michael. Drop me a comment on here and let me know how you got on with the software after purchasing it. Been wanting to buy market samurai for a while now but never fully understood exactly how it worked, until checking this out that is! Definitely the most detailed market samurai review I’ve seen online to date. Do you still use the software often? Hi Francis, glad you enjoyed the review. Yeah I still use Market Samurai at least a few times a weak to do competition analysis on the keywords I have scraped for new and existing projects. Very informative post – I have my concerns about the results between Market Samurai and Google Adwords though, for example, I enter a long tail keyword and get it rated as high competition on Adwords, SEO analysis on Samurai shows top 10 results, 9 of the 10 have page rank of 0, 8 of the 10 have 0 back links, 90% of results are green (low competition)…..
Hi Gary, thanks for your comment. In regards to your question, it’s an easy mistake to make. The Google Keyword tool’s competition stats are in relation to the advertising competition on Google Adwords. It doesn’t have any relation to the actual SEO competition data. The competition data provided in Market Samurai, along with Majestic SEO, is all actual SEO competition data for each keyword. For me, this essential feature is what separates Market Samurai from any other keyword research tool on the market. Thanks for this great review! I will use your link to download the samurai market software. Win-Win for both of us. If this is true with the 97$, you have saved me 52$, so i think it is only fair that you get some money too! Thanks! Yeah, once you have downloaded the free trial through my link, Market Samurai will offer you the software for the reduced price of $97. So i have bought it for 97$! I hope you have got the lead! Been lots of changes to Google over the last few years with Panda, Penguin and Hummingbird. Google had also removed its own original keyword tools during that time, which Market Samurai gathered much of its own data from. How have these changes affected the effectiveness of Market Samurai and can this tool be used today in 2015? To my knowledge it hasn’t affected Market Samurai in terms of keyword research and competition analysis in any way. The keyword research will still be done through Google’s API and the competition analysis using Majestic SEO’s API. I mostly use the software as a rank tracker these days but it’s still constantly updated on at least a weekly basis so the guys will no doubt be keeping on top of any changes as always. Hi there…..can you tell me please if you can localise the searches right down to a smaller area within a particular country ie just Watford. While you can get competition analysis for any keyword (including keywords containing ‘Watford’), Market Samurai doesn’t drill down to city/town level I don’t think. It has a huge list of countries that you can run checks in but in terms of cities I don’t think so. It shouldn’t make much difference anyway because at a local level you can get the search volume from Google no problem, and 99.9% of local searches are going to be very low competition and easy to dominate anyway. Hope that helps. Market Samurai is still a good option in 2015? Yeah, definitely. The software still does an excellent job at providing data that is essential for anyone in the SEO game. A fabulous review of Market Samurai, and after reading it I then read 3 other posts from yourself Jamie, and I must say the detail and level of clarity your discourse gives is outstanding. I look forward to reading many more of your articles, in the mean time I will go do the freebie on MS as my site is unknown at the moment so hopefully with MS I can get it going. “Google had also removed its own original keyword tools during that time, which Market Samurai gathered much of its own data from. Thanks a lot for the kind words, much appreciated! As far as I’m aware, Market Samurai is still using Google to gather keyword data. I haven’t set up any new campaigns in a while so can’t be sure of this, and am not on a computer with the software installed on it at the moment so can’t check unfortunately. I know that when I get rank tracking email updates every week and I open the software to check them, I almost always get an automatic update notice. So the guys are still keeping on top of the software like they always have. That’s one of the main reasons I chose to recommend it. While it used to be an AMAZING tool a few years ago before Google blocked the access to unlimited rank tracking, the creators have still managed to evolve and keep the software valuable, especially for what is just a one off payment. They have continued to update the tool for years now, and that’s very rare in this industry. I can only think of a few full of one time fee tools in the internet marketing industry that are still prospering and being fully supported like Market Samurai is. Does Market Samurai work equally well with keywords for Pinterest and Instagram and other social media apps and programs? I bought this software last week (on the recommendation of another author) and it has changed my life already! I rarely sing the praises of software these days – so many people are exaggerating the power of their product – but believe me, this stuff is Powerful. Great review for MS – but what really gets me is that they still don’t really keep you in the loop with what’s happening. with the new cloud platform I do hope updates etc improve. Thanks for sharing your info buddy.. I make a very good living online using various methods which I am going to teach you how to do absolutely FREE! If this is your first time visiting the site, take the time to read through my tutorials and reviews. If you find one you like, then focus on that one method and if you put enough effort in, there's no reason why you can't eventually make a good living online too.